Location, location, location is one of the biggest attributes of working with the Flottman Company. Our secure, dedicated and specialized 20,000 square foot miniature printing, miniature folding, insert production facility is located in Northern Kentucky. 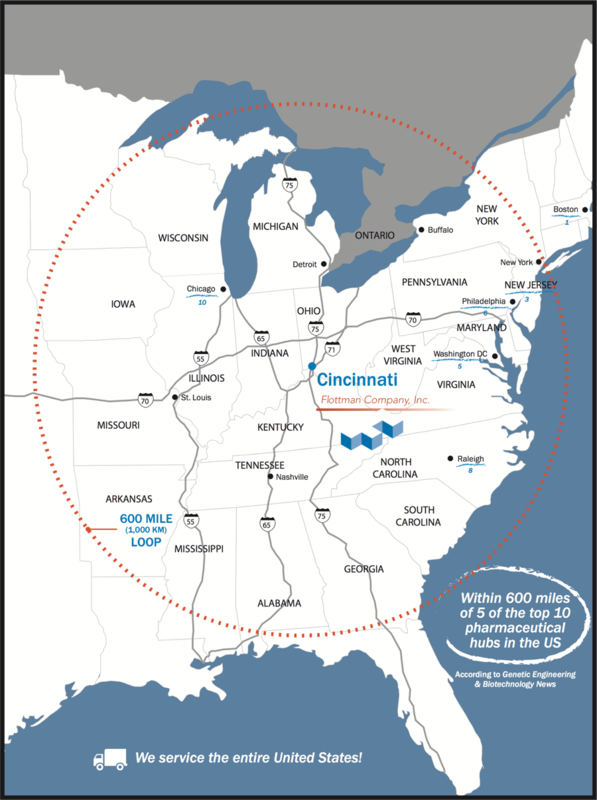 We are strategically positioned just across the river from Cincinnati, Ohio and adjacent to the Greater Cincinnati/Northern Kentucky International Airport (CVG). Our proximity to the Cincinnati International Airport, named the #1 Regional Airport in North America, enables easy travel for client visits, as well as inspections and audits of our miniature folding and printing facility. The Cincinnati/Northern Kentucky International Airport (CVG) is known as one of the fastest-growing cargo airports in the US. According to data from the Genetic Engineering & Biotechnology News magazine, Flottman Company is within a 600 mile radius of FIVE of the Top 10 Pharmaceutical Hubs in the US. Our miniature folding and miniature printing capabilities are within reach of all our nation’s major pharmaceutical players. We supply our inserts to medical device, nutraceutical and commercial industries across the entire United States as well. With over 45 years of experience providing miniature folded inserts and outserts, our skilled team excels at rapid production, error free work and on-time delivery. Members of our highly trained staff and production teams individually average 12 years experience in the medical device, pharmaceutical, nutraceutical and commercial folded insert supply industry. Our employees are dedicated to our region, our company and our industry. The Rxperts Group partnership, established over 16 years ago, continues to provide unparalleled redundancy and reach, by extending our production footprint west to Chicago, Illinois and south to Miami, Florida. This unparalleled partnership allows for one-stop service for any industry in the United States and Canada, providing the gamut of miniature folded inserts, folding cartons and labels. For many of our clients we provide special shipping specification including drop shipping, blind shipping and brand-mark shipping. Our inserts are packaged in trays and then placed in cartons, all uniform in size based on your project. Particular miniature folding partners request our packages plain, while others request branded cartons.